On my flight the First Class cabin was full, and so from the moment I boarded the plane until I left the cabin was very active, and the flight attendants were kept quite busy. Here is a short video clip of the cabin interior. While my wife seated me in 2A to avoid being too close to the lavatories and the stairway, in my view the best seat is 1A or 1K if you want to easily watch movies and use the entertainment system, as I'll explain later. 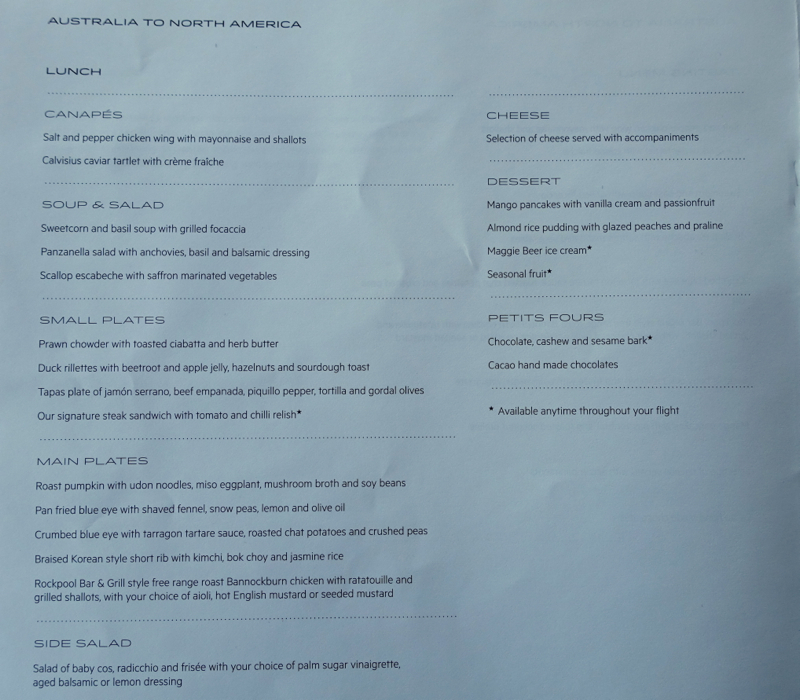 Note that there are no true couples seats in Qantas First Class, since the seats are in a 1-1-1 configuration, although you can easily dine with a partner with your companion seated on the ottoman. 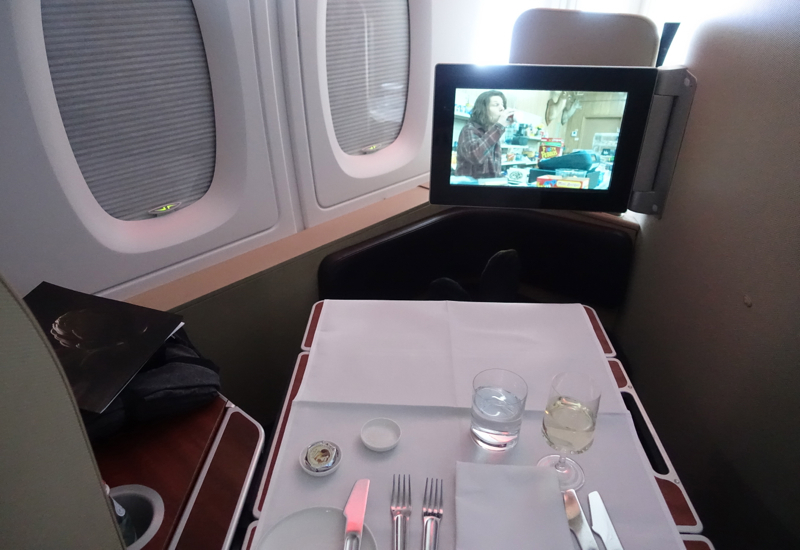 I was traveling solo, since my wife and son traveled back to the U.S. in Etihad First Apartment, but if they had been traveling with me we would likely have taken three window seats one behind the other. After take-off, the seat then swivels to angle away from the aisle, so that in my case (with a window seat) I was facing forward and to the left, toward the window. This kitty-cornered design means that the seat now faces toward the video screen, and can now fully recline diagonally across the suite space. 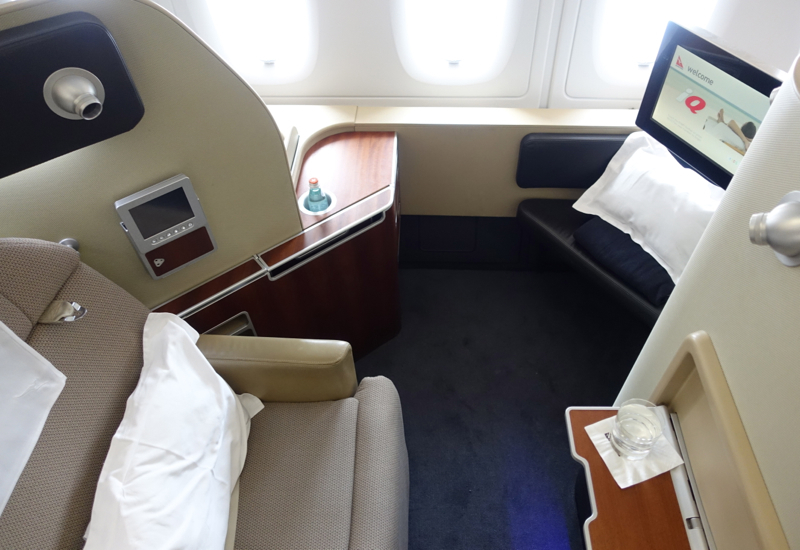 I am not really sure why the suite is designed in this manner; I found no advantages to this setup, and only problems as compared with other First Class experiences. 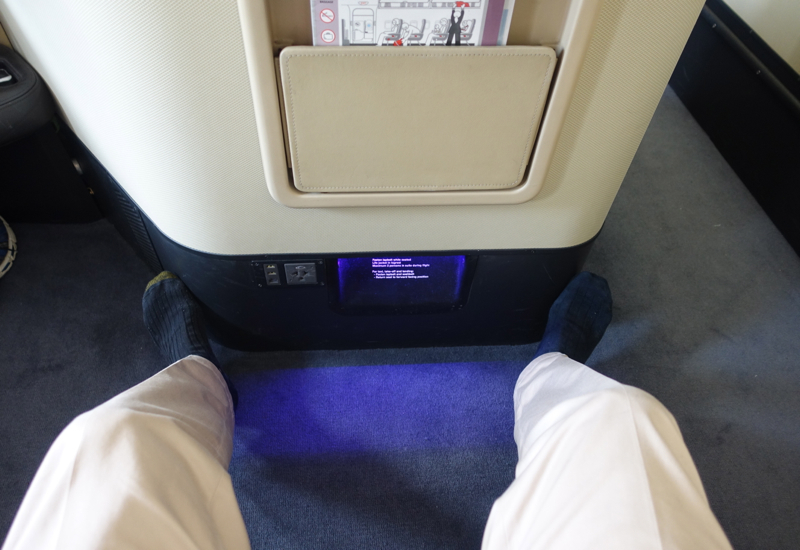 As I have already said, the leg-room at take-off and landing is cramped if you are tall or have long legs. Second, due to the layout, behind the video screen there is no wall, but instead you see the window area of the seat ahead of you, which makes watching any video very difficult due to the glare. Here's a photo, although in the photo there is less glare than I experienced much of the time. So, as you can see, you have no control over whether the windows immediately behind the screen are open or shut, and watching any film becomes very difficult unless you have a friendly neighbor who is willing to accommodate your needs. Simply put, this is a ludicrous and highly-flawed design. Third, when you position the seat as a flatbed, the angled layout means your head is positioned mere inches away from the aisle, and there is no sliding partition to block you off from the aisle. So you have no control over how much light and noise is occurring inches from your head as you are trying to sleep. On my flight, when every seat was taken and passengers opted for a wide variety of sleep times, this is simply unworkable, even with sleep masks and ear plugs. Last but not least, unlike other First Class cabins, on Qantas there is overhead storage, which means that if you're tall, you have to stoop in your suite in order to avoid banging your head. I inadvertently banged my head a couple times. 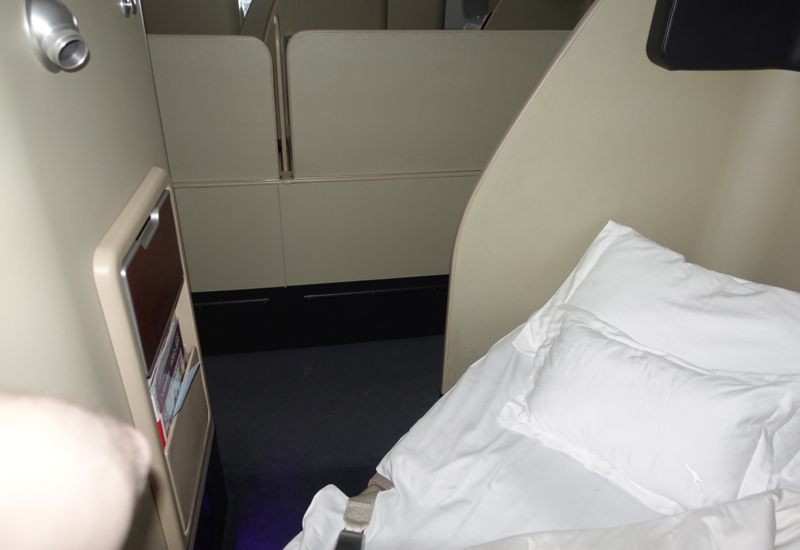 I would give the Qantas suite design an “F”. 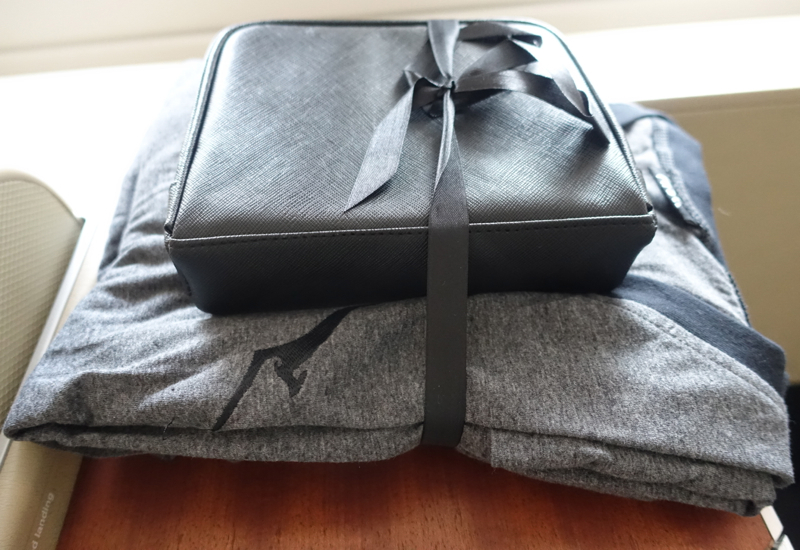 Qantas pajamas, as my wife has noted, are comfortable cotton and some of the most reusable of any airline pajamas, since the top is a grey t-shirt with black trim and the Qantas kangaroo logo, but without any lettering. The XL pajamas fit my 6'5″ frame. 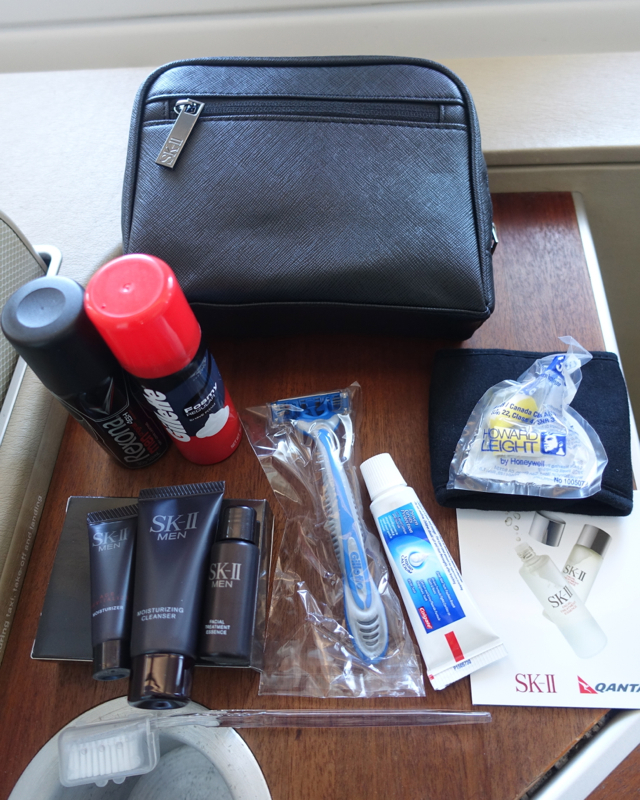 I pretty much never use any airline amenity kit products except for the earplugs, but my wife commented that SKII is one of the top anti-aging skincare lines. I wouldn't know, but I'll take her word for it. I also noticed that the amenity kit included deodorant, which few amenity kits include, so that could be handy if you've inadvertently packed yours in checked luggage. 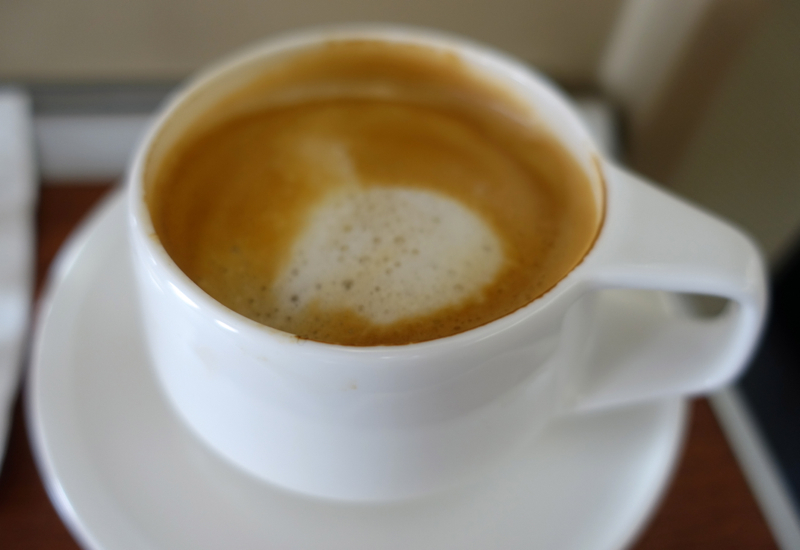 After take-off, I asked for a latte, which woke me up. 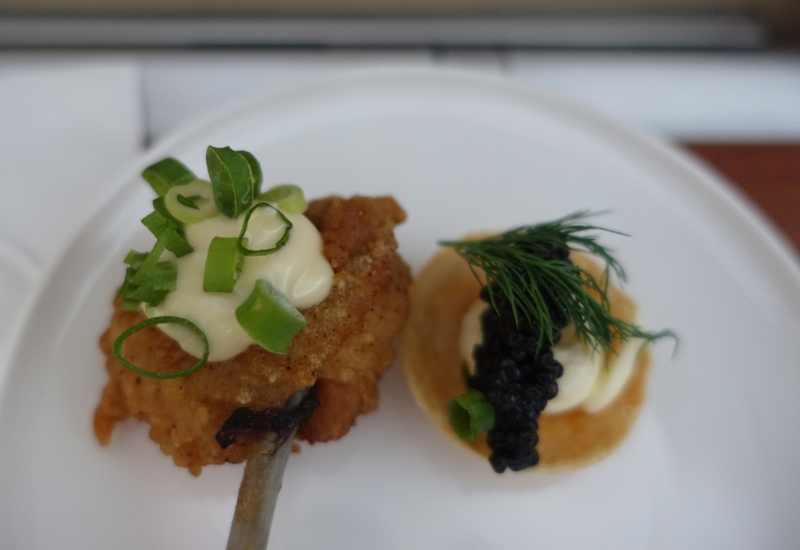 I was then asked for my choice of drink, and chose a Leuwin Estate Art Series Riesling 2014, which was delicious paired with an appetizer of chicken wing with mayonnaise and shallots, alongside a caviar tartlet with crème fraiche. It was absolutely delicious. First came the garlic bread, which came with real chunks of garlic. 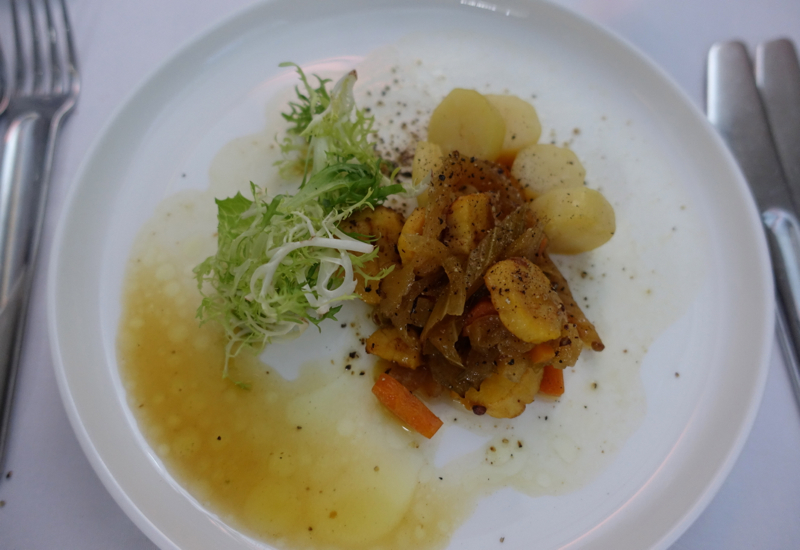 Next came scallop escabeche with saffron marinated vegetables. 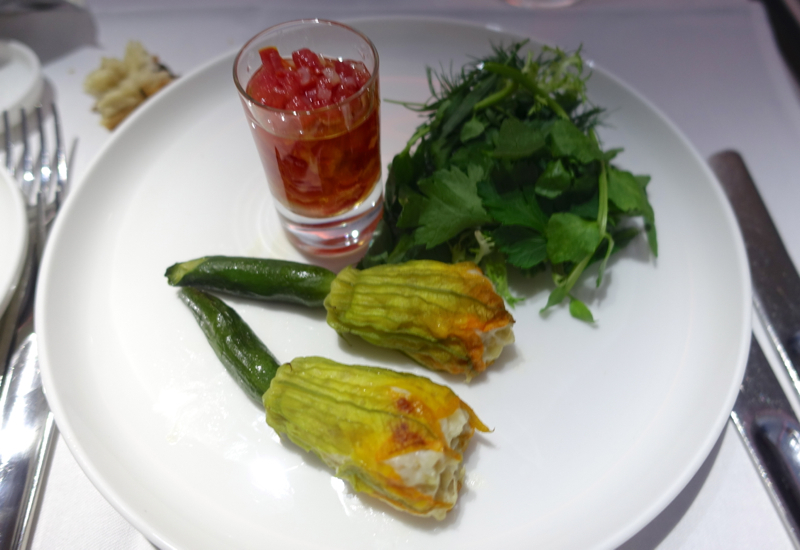 The attendant noted one item that was off menu and was simply delicious: zucchini blossoms stuffed with crab. 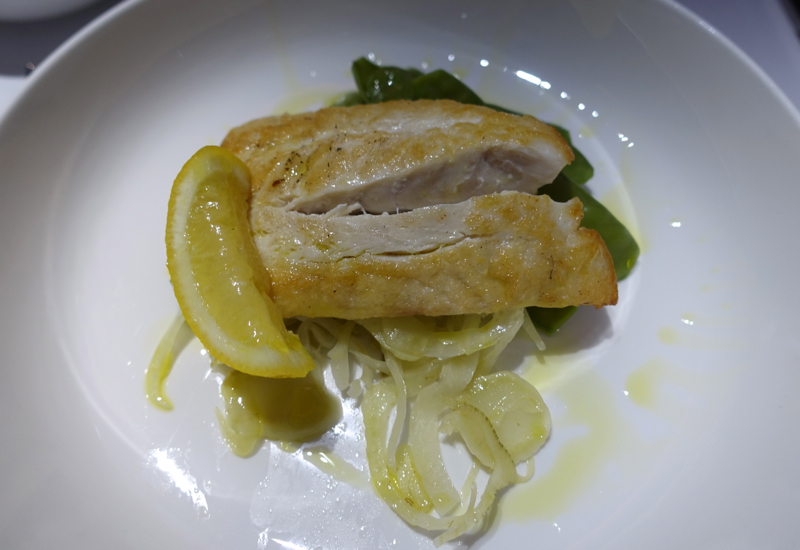 For my main, I ordered the roast chicken with ratatouille and grilled shallots, with mustard, along with a salad of baby cos, radicchio and frisee. 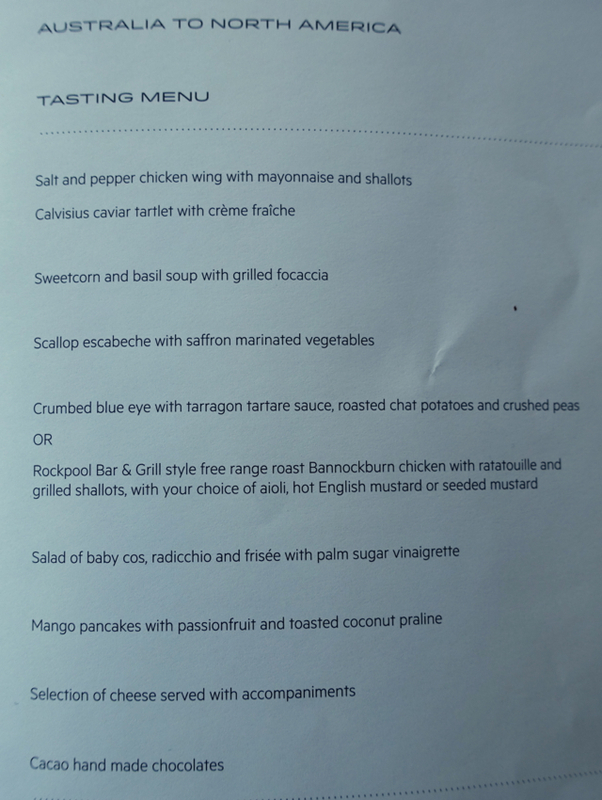 All the food was top-notch and perfectly prepared, so I began to forget about my complaints with the Qantas First Suite layout. 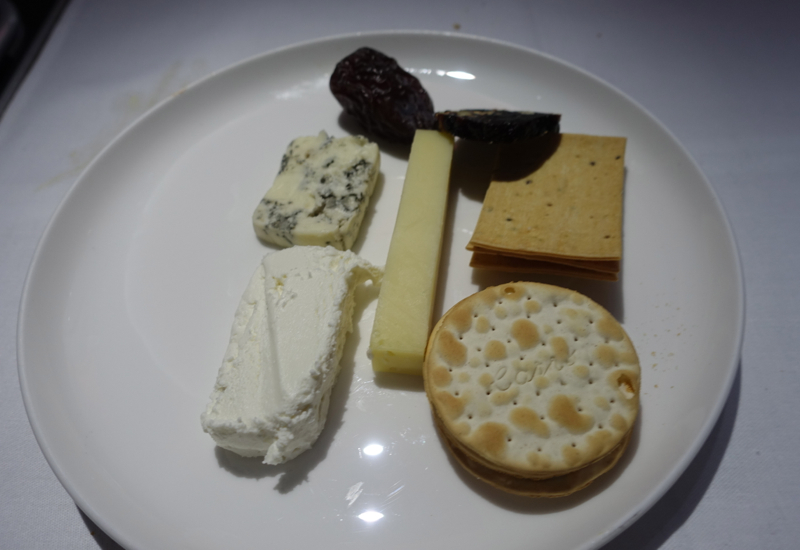 For dessert, the cheese plate was wonderful, although my wife probably would not have been as enthusiastic, as the cheeses were quite standard, nothing too unusual–a chevre, cheddar and Stilton. 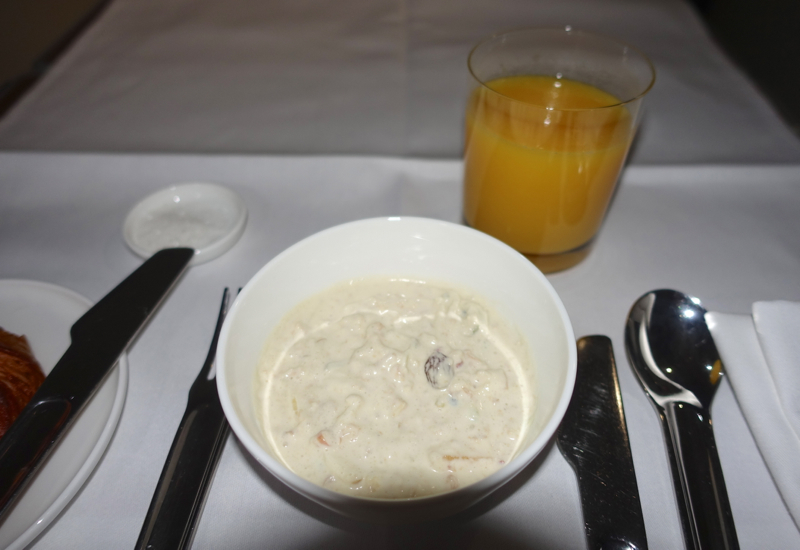 For breakfast, I first had orange juice, then a danish and bircher muesli. I next had the scrambled eggs on toast with bacon, hash brown and mushrooms. The breakfast was hearty and fresh, and really helped to put me in a good mood again after a less than successful attempt at sleep. Despite the full First Class cabin, the flights attendants were prompt and responsive. In general, the staff did their very best to attend to the various First Class passengers, which meant that they were friendly and brisk, without much time for chatting. I will say that my particular flight attendant was male, and perhaps the gender dynamics made for a different experience, but I found his service to be unusually brusque and to-the-point, which meant that there was no pleasantry or grace that one usually associates with First Class flight attendants, who have happened to always be female on my other flights. I was not made to feel special, but instead felt that I was one more passenger whose needs had to be addressed. After lunch, I settled in for a couple films for in-flight entertainment. 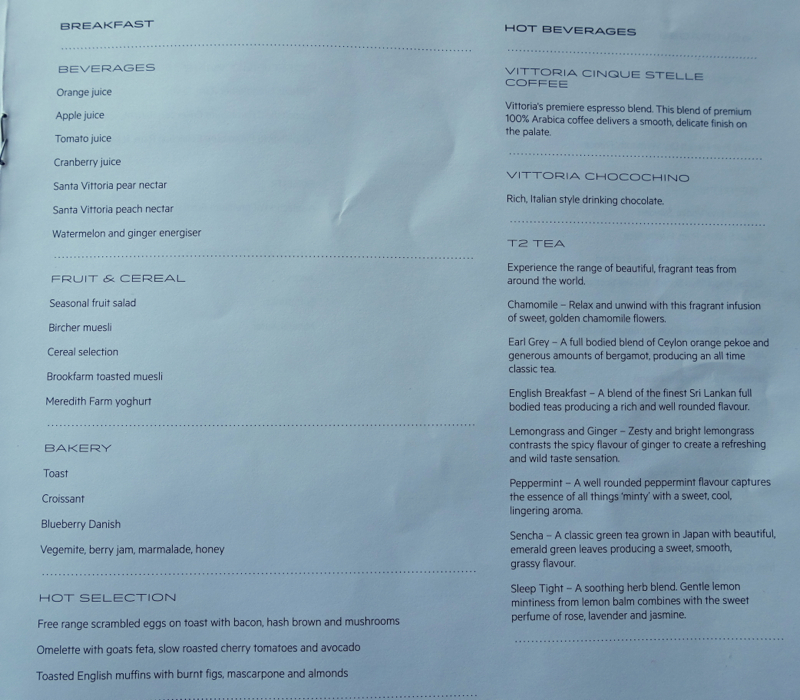 The selection was good, but not as good as other airlines such Singapore Airlines, or Cathay. I chose Grand Budapest Hotel, American Ultra, Holmes. My chief complaint with the entertainment system I have already mentioned, and that was the glare from my neighbor's windows, but I was also annoyed that at least with my system there was no way to select films other than using the touch screen on the main console, so the remote control and iPad-ish local small screen for me were superfluous. 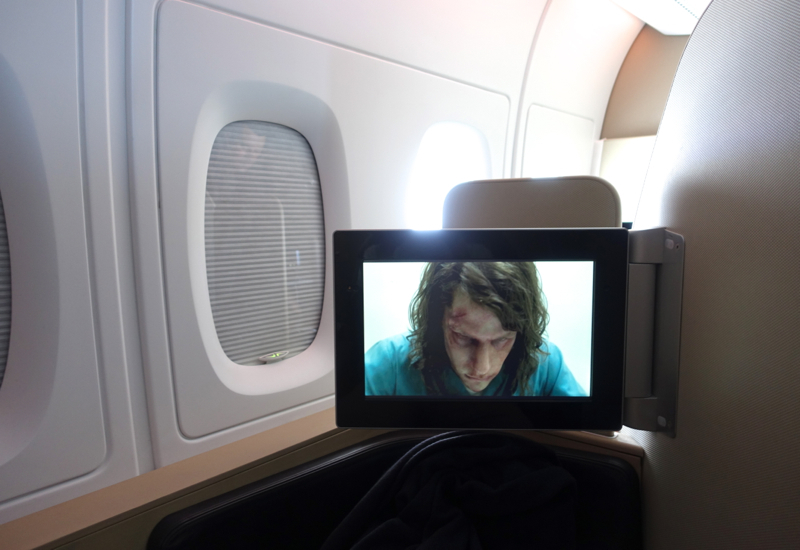 I even asked a flight attendant for help, and he wasn't able to get my remote control working either, in terms of selecting a film. After watching some films, I wanted to be rested for my arrival in LA, so I asked that for turndown service and for my bed be prepared. Here's a photo of the bed. As I said previously, sleep was difficult because my head was right near the aisle, with no partition blocking light and noise. Also, the bed itself was nowhere near the level of comfort one finds on Singapore Suites. 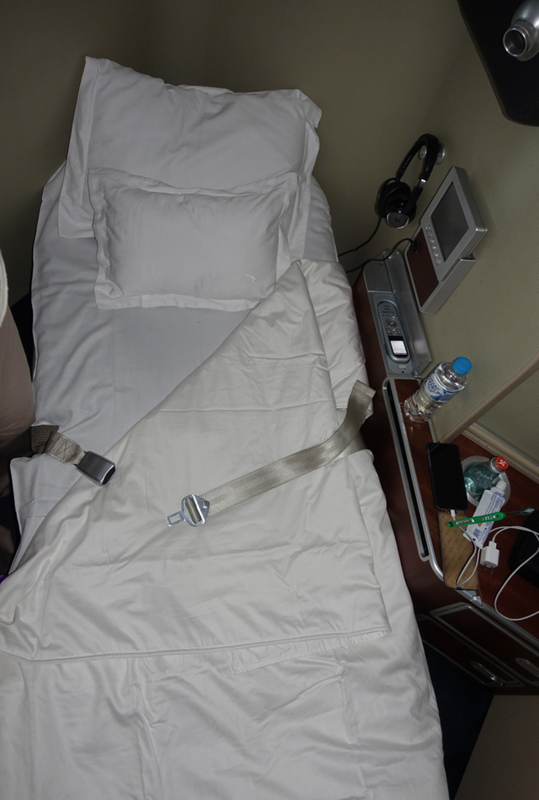 Overall, the best I can say is that the bed was flat, and there was ample space to stretch out, but compared to the other carriers the sleep quality was simply not as good. I have to say that I was very disappointed by the multiplicity of inconveniences and outright discomfort caused by the swivel-seat apartment design. 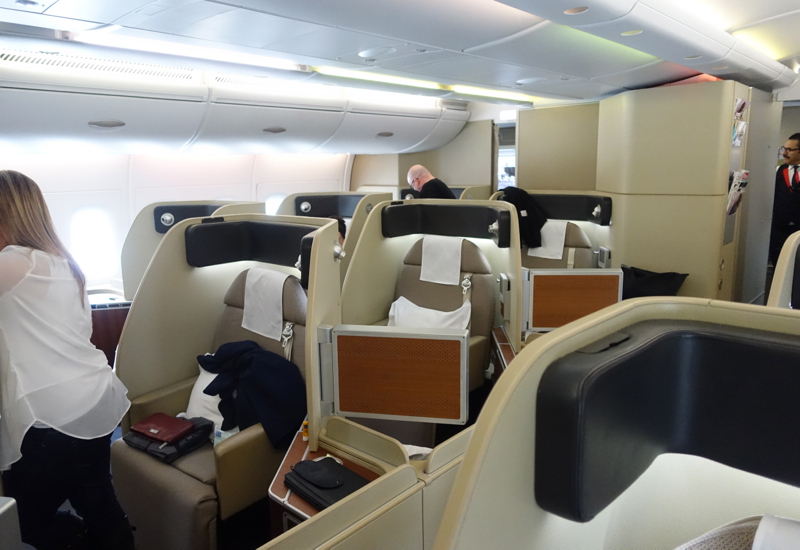 Of course, the experience was still First Class, and for that I was grateful. 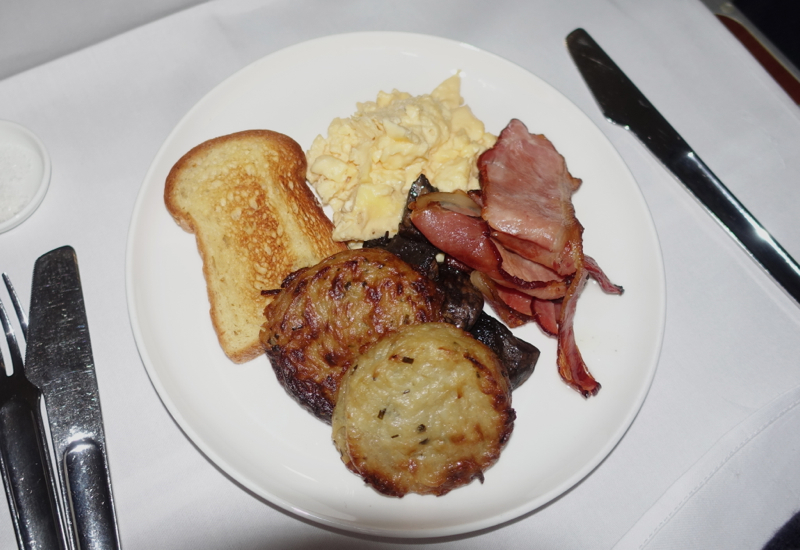 The bright spot was the food, and a staff that did their best to address the full cabin, but overall the experience was the worst I have had when flying First Class. Have any other tall passengers had a similarly frustrating experience in Qantas First Class on the A380? 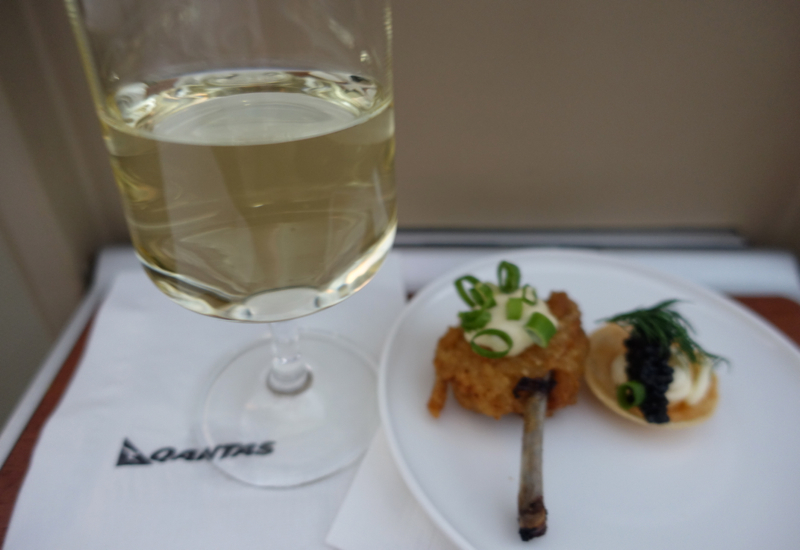 1 Comment on "Review: Qantas First Class A380 Sydney to Los Angeles"